On January 14th, 1975, Major Peter Makowicka, aged 33, was on a training mission with his Mikoyan-Gurevich MiG 21 plane. During approach on the military airbase Cottbus, German Democratic Republic (Eastern Germany), the plane experienced an open cover latch on the engine compressor section, which had been insufficiently secured by a maintenance technician. The engine switched off. 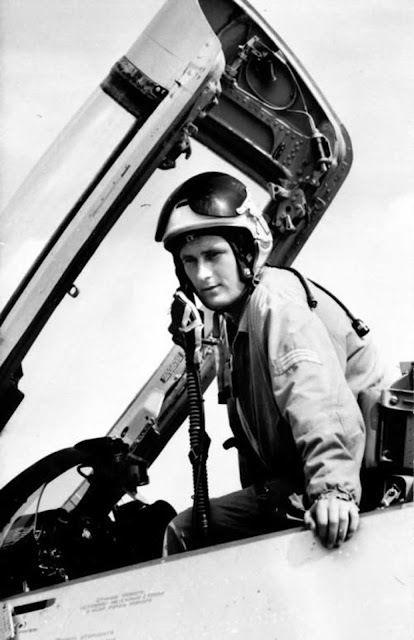 Immediately after the distress, the military control center ordered the pilot to deploy the ejection seat to save himself and to let the plane go down. But Major Makovicka disobeyed, instead he pulled up to prevent the plane from crashing into the TKC (Textile Combinate Cottbus) with its thousands of workers, intending to let the plane crash into an empty field instead. There was no time to get that far away. 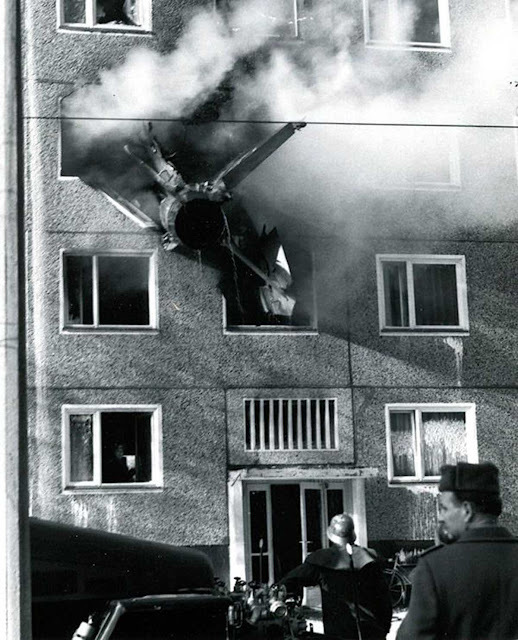 In the residential area behind the factory site, the aircraft grazed the roof of a building and at 10.15 am pierced a “Plattenbau” (a 5-story large-panel system building) across the street. Mackovicka and five women were killed on the spot. The plane had hit the second floor of the apartment block. The plane had hit the second floor of the apartment block. The fire had spread from the basement to the 4th floor. It was unknown whether the plane carried ammo. However the fire chief correctly deduced acute danger from explosions. It was decided to attack the fire with from the street side and to evacuate the other entries. The decisions later prove to be right. The firefighters discovered that the plane still carried more than 800 liters of fuel. Upon impact, all four tanks had ruptured and the entire fuel escaped instantaneously, explaining the intensive burn and multiple, deflagration-like flare-ups on the 1st to 4th floors. One hour and 15 minutes after the crash, the fire was, by and large, extinguished. All in all, 200-300 firefighters, police, medics and NVA soldiers were on the scene. 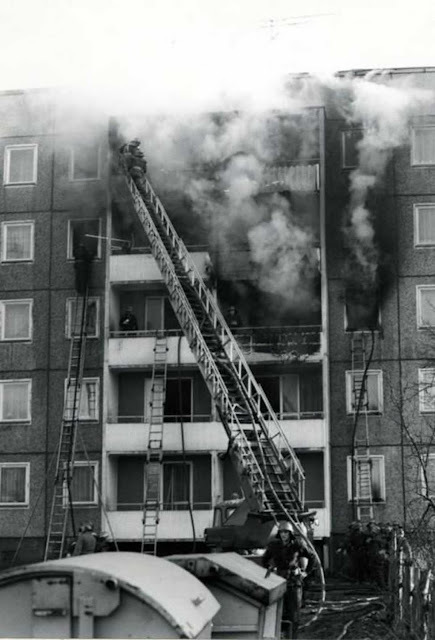 Sixteen residents suffered severe injuries, many had jumped out of the windows in panic. One woman died in hospital, raising the death toll of the accident to 7. The area was sealed off hermetically. Two days later, only a patch in the wall remained as evidence for what happened. The official news agency ADN reported only that a plane crashed, killing six people — and that an official commission has been tasked with the investigation. The technician who failed to close the latch properly was sentenced to five years in jail. Major Peter Makowicka, likely the only NVA (National People’s Army) hero ever to disobey an order, posthumously received the Kampforden für Verdienste um Volk und Vaterland in Gold (Combat medal for the merits for the People and Fatherland) and other awards.